Memory is definitely being harmed by smart phones doing it for us, but then I wonder if early man thought our natural ability to withstand the cold was being harmed by the first clothes? As long as Google doesn’t end up owning all my memories i think it’ll be ok! Also I would’ve thought that if the human race were to diverge into sub-species it would’ve happened before the age of cross continent travel and stuff making gene flow between populations so easy? Interesting idea though, as a ginger I worry about going extinct..
You make a good point. I remember reading somewhere that it might be the polar opposite of genetic divergence. With all the global travelling and inter-racial breeding, we may be heading towards a situation where the entire human race have one generic tanned look. Not good news for the ginger minority. I hear extinction might be on the cards for your people. Interesting post! Isn’t evolution and extinction inevitable? If we do go the way of the Neanderthals, wouldn’t it be more due to an inability to adapt rather than a direct reliance on technology? In order for technology itself to advance we have to be capable of developing it which implies adaptation. Yes, human evolution may destroy ‘us’, however, I’m not sure this is such a bad thing. 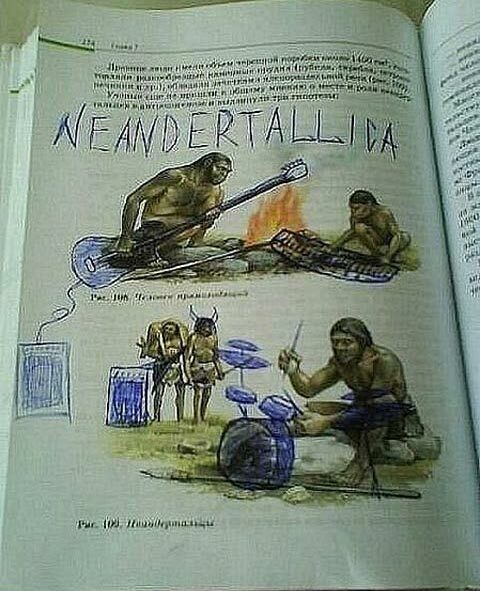 Loved the Neandertallica illistration!